You may have already read a couple of my blogs about great deals I’ve found on ThredUp, but do you ever wonder where some of the clothes come from? Well, much of the items come from people just like you and me via their Cleanout Bag program. It sounds promising when you consider ridding yourself of next-to-new items you just don’t wear (or have never worn) in order to earn credit to spend on “new” garments. You can choose to take a risk, sending in clothing they will either accept or recycle responsibly. OR, you can choose to have what they don’t accept sent back to you at a cost. From start to finish, sending in my bag, ThredUp receiving the bag and processing it took approximately 3-5 weeks. Had it been before a major holiday such as Christmas I’m sure I would have expected things to take a little longer. Email updates kept me in the loop throughout the entire process which was comforting. Once I received an email notification that my bag had been processed I skimmed through the details. 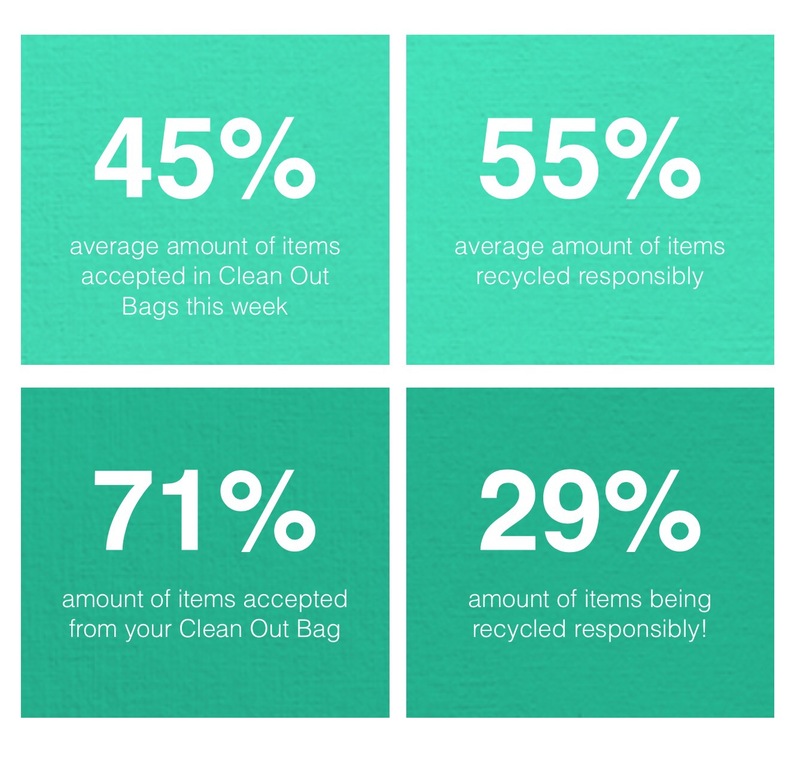 It was great to see that my bag exceeded the average percentage of accepted items per bag. I believe my acceptance rate was boosted by sending in neatly folded, clean, like-new and even new articles of clothing. Initially, I was very excited about the $13.25 payout and proceeded to click on the link to see what they had accepted from my bag. Many of the items I sent in were next to new, things I had worn only a few times, some only once. One top was new with tags and a pair of leather Nine West heels were in the original box complete with size stickers on the soles, never worn. Up front, the bag didn’t cost a dime to send in and the size of the bag provided was HUGE. As you can see in the photo below, the process quickly became frustrating when I realized the $10 processing fee wasn’t deducted in the email informing me of the payout. If what they accept is under $10 in payout, you will receive no credits and they will waive the remainder of the fee. 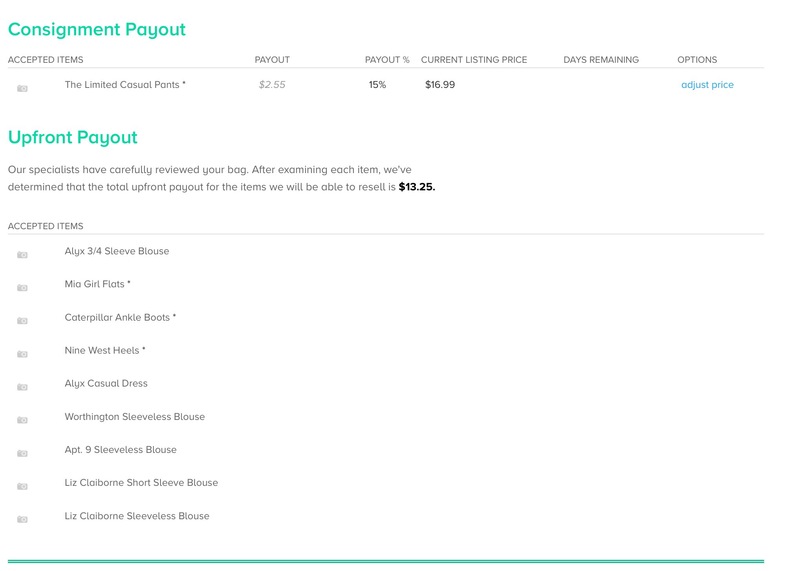 If your accepted payout is $10 or more, they will take the fee off the top. 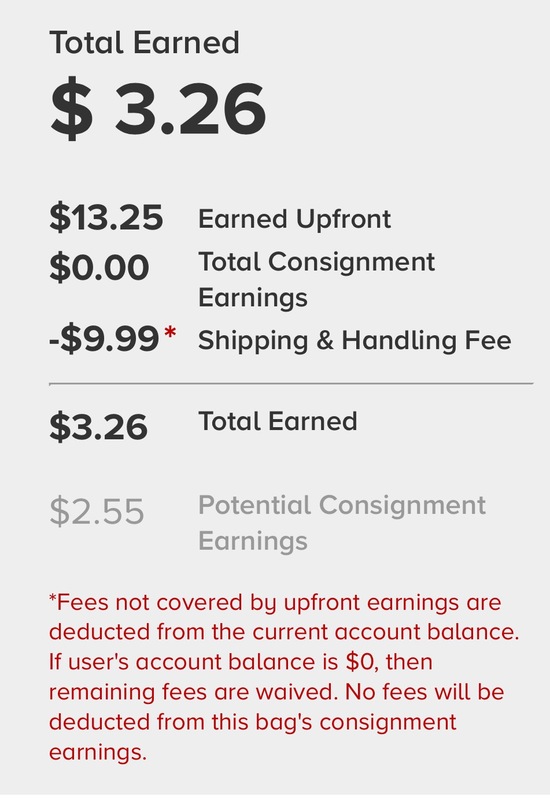 I’m guessing you could only imagine my deflated joy once I realized I only had $3.26 worth of credit with a pending consignment item worth to be an added $2.55 in my pocket. The consignment…which I’d only receive 15% of the selling price, could possibly be further marked down if the item didn’t sell right away making it worth even less. To sum up my experience, I was disappointed. Yes, I do understand ThredUp must make money and that is why when you BUY from them you get great deals. Just don’t expect a windfall to come your way in exchange for the hundreds of dollars of clothing you might send in. I know for fact I will shop again at ThredUp.com, the deals are too good not to. Sadly however, I will not be taking part in another Cleanout Bag. For what credit you might get, the clothing would be far better served by donating them to local secondhand store such as Goodwill or to a shelter. Give someone in need a leg up if you have quality items that no longer serve a purpose in your own life. It could make all the difference in someone else’s.